I've already written about the strangely rural qualities Flint seems to be exhibiting as the population drops, as well as the increasing popularity of community supported agriculture in the Vehicle City. Now comes word that the Genesee County parks commissioners have approved deer hunting in some county parks. 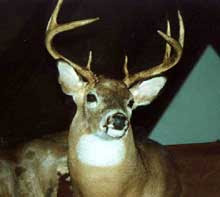 "We are looking at some form of managed hunt to get the deer population under control. But right now open hunting is not one of the options we're considering," said parks Director Amy McMillan. "For us, it's not about the recreational aspect of hunting. It's about wildlife management. And it's not about to hunt or not to hunt. It's about protecting the environment."